“I have always been drawn to darkness,” Elaine Leeder writes. “I know I always championed the underdog.” As a sociology professor at Ithaca College in the 1990s, she began teaching at Elmira Correctional Facility in upstate New York. When she moved to California, that same desire to help led her to the prison education program at San Quentin. Then, inspired by her lessons, a group of Leeder’s students approached her about working with a program the prisoners had established to aid in their long and difficult process of redemption and transformation. She accepted. These members of New Leaf on Life—the San Quentin “lifers”—have been sentenced to terms ranging from fifteen years to life in prison. Unlike Death Row inmates, who will either die in prison or be executed, many of the lifers are eligible for parole after having spent twenty to thirty years behind bars. But too often, they never see that opportunity because of the popular view that they are all “hardened criminals,” killers incapable of rehabilitation and unfit to be free. My Life With Lifers shares the journey of a woman “on the outside” as she discovered the true nature of life in prison, and the roadblocks–so many of them unneeded–on the inmates’ path to freedom. What Leeder’s experiences add up to is both a fascinating human story and a reasoned and impassioned case for prison reform. I have always been drawn to darkness and the dark side of people’s lives. It may be because my father’s family was killed in Lithuania during the Holocaust; it might also be because my mother’s people were immigrants from Poland, with many of the troubles that immigrant families experienced, including poverty and mental illness. My childhood home always had the shades drawn so the neighbors would not see what was going on inside. In my father’s village in Lithuania, it was the neighbors who turned in the Jews and watched them being marched off to the pits where my family was shot and buried. My father spent his whole life remembering his dead mother, sister, and brother, and feeling survivor’s guilt for having made it out alive before the war began. Whatever the cause of my being drawn to darkness, I know I always championed the underdog. In the first grade, a young African-American friend called for me on the second day of school, but my mother told me I could not walk with her or be her friend. I knew something was wrong with the way we dealt with the “other.” To me, there was no “other”–she was my friend, and I would spend time with her, no matter what I was told. This rebellion stayed with me through childhood, college, and later life. By the time I was in college, I had marched with Martin Luther King before his famous “I Have a Dream” speech. In Boston, where I went to school, there was a rich tradition of rebellion, and it was easy for me to find it. I smoked pot before it was “in,” beginning as early as 1965. I joined civil rights and antiwar activities, and I was in a feminist consciousness-raising group as soon as such movements emerged. In these groups, I discovered that as a woman in a patriarchal society, I, too, was an underdog. When I saw that I was discriminated against as a woman, I began to identify my dissatisfaction with the way things were in our society; I was tormented by social inequality, gender discrimination, class bias, racism, and militarism. As a social worker in New York City, a therapist at mental hospitals and mental health clinics, and while working with alcoholics and drug addicts, I was fascinated by people who did not fit the norm. I always wondered how they could do it, since I tended to be someone who could not do much that was illegal. After many years of education and training, I became a college professor. I began to study deviance and its complexity, wanting to understand what drove people to do harm to others. At first, I began working with victims of domestic violence, but I was soon drawn to the perpetrators, to the challenge of their complicated minds. As a feminist, I felt it was my social obligation to work with people who caused pain to women. While working in a summer program for students about to enter college, some of them asked to visit a prison. I, too, was interested in such places, knowing that people there could help me understand perpetrators of domestic violence. In 1995, in what was to be a pivotal moment in my career, I took the high school students to the Elmira Correctional Facility in upstate New York for a tour by the warden. I was struck by the cold, harsh facility and the fact that it was 150 years old. When the tour was over, I asked the warden if the inmates had any educational opportunities. He said they had only GED classes and some self-help programs like Alcoholics Anonymous (A.A.). In an impetuous moment of generosity, I offered to bring some college education programs inside. The warden was thrilled, and thus began my career with prisoners. Several years later when I moved to California to become the dean of social sciences at Sonoma State University, I discovered a prison education program at San Quentin State Prison. Drawn once again to the dark side, I began volunteering there and was once again taken with the work because it was so gripping to find human connection in such a dark and miserable place. When the class ended, a few prisoners who were my students asked if I would lead a group of lifers. I was flattered that they thought enough of me to have our own group. New Leaf on Life, a name chosen by the prisoners themselves, has continued since its inception in 2005. These men were sentenced to life in prison–with the possibility of parole—not to death in prison. And yet there they stay because of the attitudes and prejudices against them. Having paid their dues to society, most pose no risk to that society anymore, and many guards, educators, and administrators in prisons agree that they should be out. In California, it costs $46,000 a year to incarcerate a prisoner. Certainly, this money could be better spent elsewhere than for these men who no longer need to be there. The experience in prison has set me on a new path of work. I have learned much from my students, perhaps even more than they gained from me. In this book, I share these lessons I have learned as I watch men inside begin the long and difficult process of redemption and transformation. In this book, I will tell you some of these stories, since every one is different. Though they have committed terrible crimes, these are not evil people. For the most part, they are aware of and disturbed by what they did. I have learned that each one has a family traumatized by his crimes, as the victims and their families have been. Most are remorseful for what they did, and often want to make amends to the victims, their families, and the community they have harmed. I also have learned there is little to no rehabilitation in prisons, and that if a prisoner is to transform, it is done through sheer grit and determination–succeeding in spite of the system, not because of it. I have learned that people who commit crimes can change, and that many of them could do more good on the outside working with young people. These men were once directionless kids in gangs, often in trouble. Sure, there are inmates I would never want to see on the streets, but they are the minority. In fact, the U.S. Department of Justice estimates that 95 percent of those who are incarcerated will be eventually discharged. Therefore, it is imperative as a society that we do something for these prisoners so they can become contributing members of our world. The mass incarceration we in the U.S. are living with now, particularly of people of color, can be considered the newest form of slavery. Angela Davis argues in her book Are Prisons Obsolete? (Seven Stories Press, 2003) that this incarceration binge is a contemporary manifestation of the racialized disparities that many of us believe were abolished in 1865. In fact, more black men are in prison now than lived under slavery. From 1990 to 2003, African-Americans made up the majority of the increase in incarceration, with the number of imprisoned blacks jumping 76.2 percent from 360,000 to 621,000 (Wright J., 2006). Now, 3.5 percent of all black males are in prison, and more than 10 percent in the 25-29 age group (p. 316). More black men are in prison than attending college. This increase is in stark contrast to the fact that the numbers of violent crimes is decreasing at the same time! In the U.S. today, there is a movement toward decarceration. The prisoner rights movement is advocating alternatives to incarceration—restorative justice and reconciliation rather than building more prisons. It seems undeniable that economic and racial disparities are major contributors to crime, that lack of opportunity leads people to meet their needs illegally. We could take major steps toward decarceration and its many benefits if our society sought solutions to poverty and an end to both the gross inequalities in our public education system and the criminalization of drugs. My experiences with men in prison have taught me that change is possible. Here is my story and theirs. Elaine Leeder shines a bright light on the men in San Quentin as she brings their voices to us. We hear the pertinent, intelligent, and poignant things they have to say, which might just enlighten us and give us pause and reflection. Social worker, sociologist, university dean, and author, Leeder gets to the fundamentals of learning in her deeply personal and socially conscious accounts of her regular treks to San Quentin to teach classes to men who may never be released from prison. 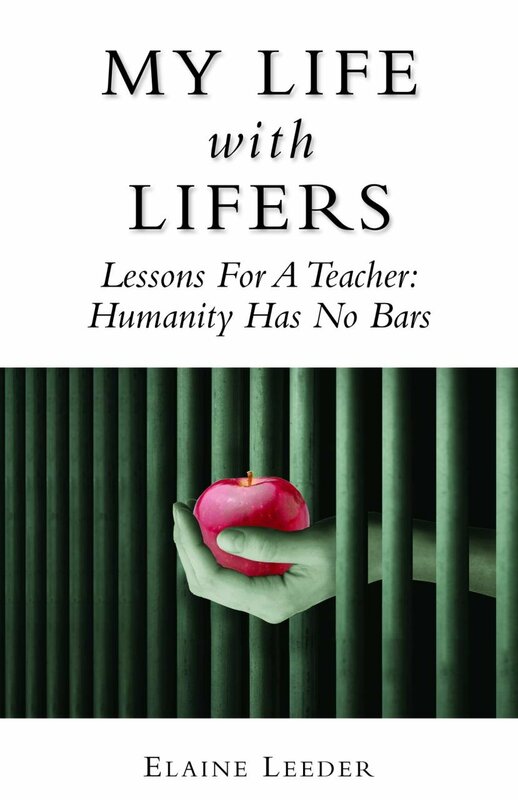 My Life With Lifers educates us about the penal system and enlightens us about prisoners’ thirst for learning as it excites us about a true educator’s experience of taking learning to the bereft and forgotten. In her compelling book, My Life with Lifers, Elaine Leeder gives voice to the “real people with real stories” who are serving life sentences at San Quentin. She shares the lessons she learned watching these men begin the long and difficult process of redemption and transformation, and offers powerful policy recommendations that deserve to be taken seriously.